If the geographic heart of Australia’s fastest growing city is defined by its river, then its pulse beats strongest in the inner-city suburbs that straddle it. This is Brisbane, a city that has eclipsed its southern cousins as a migration magnet for more than a decade. Ask anyone about the four city landmarks that “speak” Brisbane and they will more than likely say Mount Coot-tha, the Story Bridge, Kangaroo Point and South Bank. The fact that the latter three are integral to the six kilometre-long riverside residential, family recreational, cultural and entertainment strip, from Kangaroo Point through South Bank to eclectic West End, pushes these parts of the city into a perfect focus for Sydney, Melbourne and overseas investors. A comparison for southerners might be Melbourne’s own Southbank, though it stands to be eclipsed for sheer breadth of residential and recreational options by its Brisbane cousin. For a Sydney comparison, Kangaroo Point has been labelled Brisbane’s Kirribilli thanks to its proximity to the CBD and stunning water views from the riverside homes and apartments. The key that continues to attract buyers and investors, however, is affordability. A recent Domain news report pointed out that average Brisbane house prices were officially half the price of Sydney, while other Domain statistics have highlighted the yawning gap between income and affordability in the southern capitals compared with Brisbane. The city is no stranger to urban renewal and South Bank is a prime example, rising from the site of World Expo ’88 and now home to the world-renowned GOMA, the Queensland Performing Arts Centre, three museums, state library, IMAX cinema, swathe of beautiful parklands and bike tracks, and Australia’s only inner-city open air swimming lagoon. The link to adjacent Kangaroo Point is seamless. A dedicated boardwalk and bike track wend their way from the southern end of South Bank through the Kangaroo Point Cliffs parkland, dotted with public barbecues, picnic shelters, artworks and lookouts with historic significance. First stop is the Goodwill pedestrian and bicycle bridge that links South Bank and Kangaroo Point to the city’s north shore, Queensland University of Technology Gardens Point campus, the Botanic Gardens and CBD. The sheer, volcanic rock cliffs of Kangaroo Point are a true Brisbane landmark and offer adventurers the thrill of a rock climb or abseil, or a more direct route to the top via sets of stairs. The views across the river to the city centre are particularly breathtaking at night. Alternatively, you may want to have a paddle on the river. The acclaimed Riverlife Adventure Centre, occupying the historic naval stores site, offers a range of activities from climbing to kayaking to paddle boarding, Segway adventures to rollerblading, and even outdoor laser tag. Kangaroo Point also has its share of bars, restaurants and cafes, among them the iconic Story Bridge and Pineapple Hotels, the St James Crabhouse, Summer House, and the Cliffs Cafe with its great views. Last but not least, there’s the Story Bridge climb, the equivalent of the Harbour Bridge climb in Sydney. 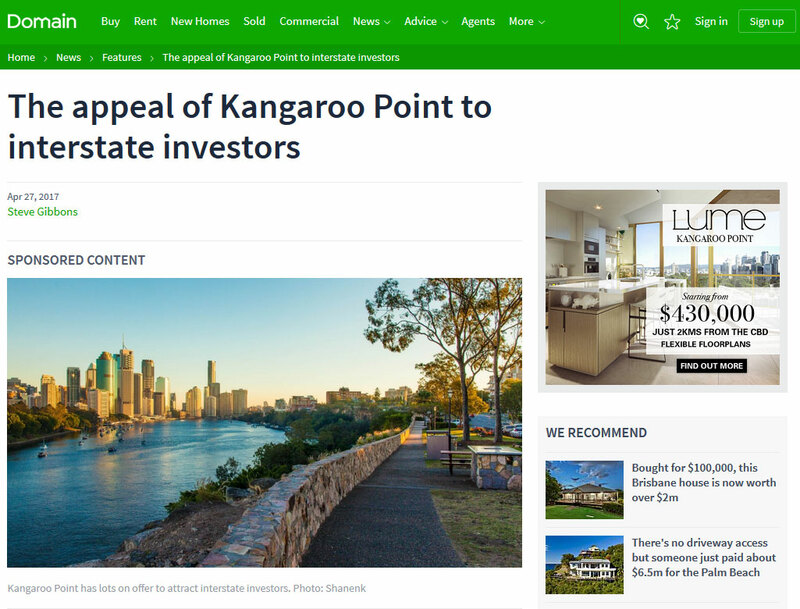 While the precinct is in high demand among buyers and investors, Kangaroo Point’s reputation for more established apartment residential has meant new developments are relatively rare. However, a new apartment development at the highest point of Kangaroo Point is attracting interest from Australia and overseas. Lume, a 119-apartment building over 13 levels, is in an imposing position near the Story Bridge and will offer sweeping views in all directions as well as direct access to all that its locale has to offer. Within easy walking distance of the CBD, it comprises one, two and three-bedroom apartments and a four-bedroom penthouse. A project under the DevCorp banner, Lume will also boast a sky lounge and rooftop community terrace to make the most of those views. Residents’ amenities include extensive gardens, a gymnasium, function space, open-air entertainment area and an infinity edge pool. Apartment features include high ceilings, sophisticated joinery and floor-to-ceiling glass doors. The lifestyle benefits of Lume and its locale are important to DevCorp managing director Murray Thornton. “In Kangaroo Point, lifestyle is everything. Brisbane’s ultimate urban playground is perfect for those who want to work, play and train, all at their doorstep,” he says. Thornton says Lume takes its striking architectural influence and identity from the precinct’s rich history. It showcases a design that is in synergy with the Kangaroo Point cliff face through sculpted vertical walls and a stone-coloured facade. For more information, visit lume.com.au.